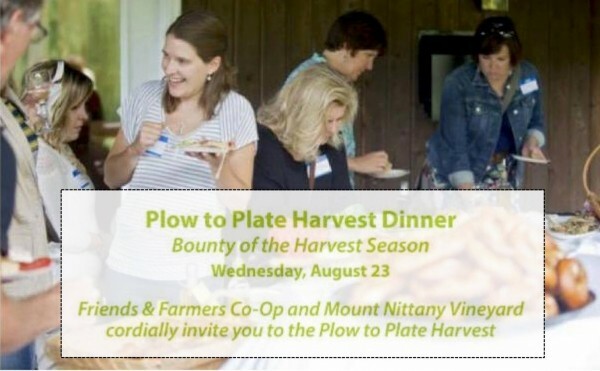 Enjoy local food, wine and the company of your neighbors at the 2017 Plow to Plate Harvest Dinner sponsored by Friends & Farmers Cooperative and Mount Nittany Vineyard & Winery. Proceeds will benefit the Friends & Farmers Co-op Online Market. The event will be held at Mount Nittany Vineyard in Centre Hall from 5:00 to 8:30 pm on Wednesday, Aug. 23. The event will kick-off with vineyard and winery tours beginning at 5 pm, followed by a dinner featuring seasonal offerings from some of the area’s best growers, producers and chefs. These include Big Spring Spirits, El Gringo Tacos, Elk Creek Café, Fasta & Ravioli Co., Gemelli Bakers, Happy Valley Restaurants, Harrison’s, Nola’s Joint Pizza, Nomad Kitchen, RE Farm Cafe, Spats Cafe, Tait Farm Foods, W.C. Clarke’s Coffee Roasters, and Zola. Tickets are $35 and includes a complimentary glass of wine for those 21 and over. Kids under 12 are FREE! Tickets available from selected vendors at the Boalsburg and N. Atherton Farmers Markets, Webster’s Cafe, and online at www.friendsandfarmers.coop. Live music will be provided by Papa and Bruce Young. -	and inspire healthy eating habits through education and transparent labeling draw the community together in an inviting atmosphere.